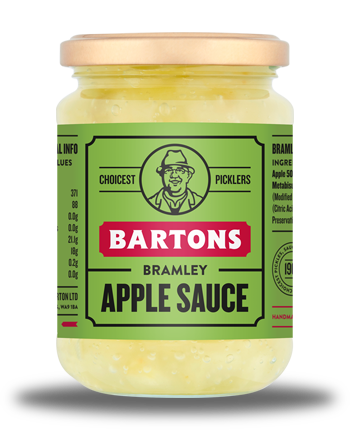 Bartons Apple sauce is a purée made of Bramley apples and sugar. Apple sauce was once a preserve for winter, since it keeps well. It is often an accompaniment to a main course. In the UK and Sweden apple sauce is often eaten as a condiment for roast pork and sausages. In Germany it accompanies potato pancakes, while in the Netherlands, people often eat it with chips. It is also a popular accompaniment in the United States and is sometimes served as a dessert there as well, alone or used in making apple sauce cake or apple pie. In France where it is referred to as compote, it is mostly viewed as a dessert and served at room temperature. For those who need more than a jar, we also have catering sizes. Apple 50%, water, sugar, modified maize starch, citric acid, antioxidant (ascorbic acid). Store in a cool, dry place. Once opened, keep refrigerated and use within 6 weeks.